Home from work, comfy clothes on, dinner already in my tummy, cozy on the couch settling in to watch Grey’s Anatomy. Happily taking only one pill tonight instead of 4 different pills daily, multiple times a day, as I had been doing for almost 2 weeks straight. With the beast removed, I was FINALLY able to go back to work after having missed more days than I wanted. I would be lying if I told you I was looking forward to going back. Having only been in this new position on my own for a week and a half prior to the stones rocking my world I was already behind… then after missing a week and a half… holy loads of work to be piled up just waiting for me. The only consolation being that if I was able to return to work that would then mean I’d be feeling better. I was beyond ready to start feeling better. So after the appointment, several self-motivating pep talks, good luck wishes from family & friends and some “bring me to my happy place” music, I headed on over to jump back in to work. …not by issues or problems but by co-workers offering help, touching base on progress & inquiries of my well-being. I was backed up and taken care of and helped and supported the whole time I was out… and that help has continued well into this week as I’m getting back into the swing of things. It’s not been an easy week by any means … there have been hiccups along the way but my days were made all that much easier by the pitching in and support I’ve received from my co-workers. After having only worked here for several months, I couldn’t have been made to feel more welcome than I was upon my return. I was made to feel like I belonged there even though my background doesn’t necessarily say that I do. You know that saying “Everything happens for a reason” that I heard more times than I ever wanted to in the month after I lost my job? The one that made me want to punch something every time I heard it, even if I was the one repeating it to myself. 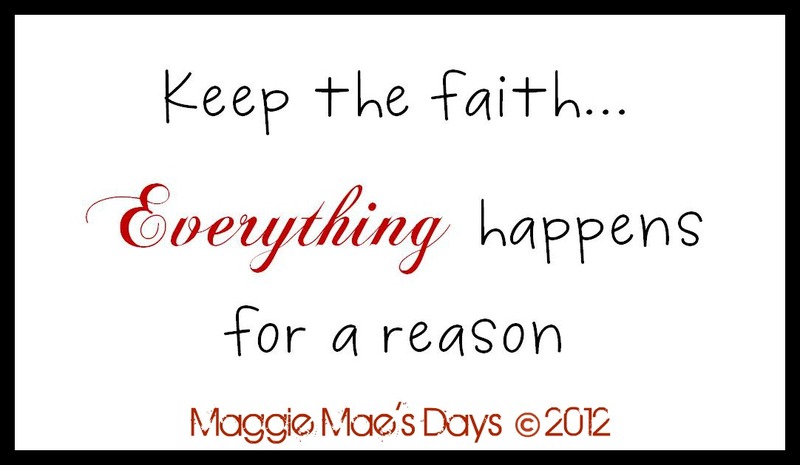 But I know deep down it is the truth… everything does happen for a reason. I am being challenged on a daily basis, learning scrupulous amounts of information and basically starting over… not many people get that opportunity. Plus, I now have pretty awesome insurance … something I didn’t have in the past. Everything happens for a reason… even if it’s not immediately apparent. Even if you have to go through a bunch of nonsensical crap you can’t even make heads or tails of. EVERYTHING does happen for a reason. So there you have it… one more day left in this work week remains. I’m pretty sure it’ll be a long one and that’s just fine by me. Health-wise I’ve got a few more bridges to cross… but for now, the immediate is remedied. I think it’s safe to say I’m working on getting back into the swing of things… Pretty darn happy to be doing so if I don’t say so myself.